I have several ideas about the final project for this course but they are a bit “outside the box.” I understand that the goal is to create a student web-based project with learning opportunities and goals for students and stated desired outcomes. Creating an individual project based on a topic or unit for a class I teach would be fine, but I’ve been recently named coordinator for a Digital Humanities initiative at Harpeth Hall School (my day job in addition to one adjunct class per semester at Belmont). One of my tasks for the summer is to work with two teacher groups to design projects that incorporate DH methods and online tools. I am working with a 1) Latin teacher and 2) a larger group that includes all junior-level English and history teachers. Aside from my DH goals, I am also a junior-level AP US history teacher giving me a dual role in that group whereby I would be creating a project for a class I teach. Another goal for my DH coordinator summer work is to design a digital infrastructure where these and other projects can be hosted as part of a larger digital portfolio. The goal is to produce something along the lines of the LEADR lab at Michigan State University: http://leadr.msu.edu/projects/. For this class I would love to work on these two separate but connected projects. I recognize that this would change the typical questions and important historical issues that the HIST689 project is designed to spark, but I am hoping that with Dr. Kelly’s approval I can find a way to approach the project requirements with a little creative license. There are still difficult questions and issues for students to make sense of– just not necessarily and solely tied to history or a course that I teach. My goal would be more along the lines of Lévesque’s argument to move (or combine) substantive content with procedural content using practices, tools, skills and methods related to DH. This module forced me to rethink the what, who, how, and why of my own teaching. I have never read any of the authors/historians given for this module (other than a little Wineburg), and I appreciated the holistic approach each provided while simultaneously offering a slightly different view on how best to teach history or rather how best to teach students to study history as a living, fluid, complex discipline. From reading about and reflecting on “threshold concepts” to “decoding the discipline” to “uncoverage” it is more apparent to me than ever that teaching history has changed little over the past century. In my own research of educational trends during the Progressive Era: elective courses, practical majors (as opposed to purely philosophical or classical majors), extracurricular opportunities, and professors as experts are still core elements of teaching history and other mainstream subject areas. I have argued that a paradigmatic shift is long overdue and we are in the midst of just such a transition. Incidentally, it’s one reason that I joined the DH Certificate Program at GMU. How do I make history relevant to students? I think the answer to this question starts with using current events, social media, and role play to generate empathy in an effort to “humanize history.” I made one attempt to do so using Twitter and allowing students to choose a figure of study from the Early Modern European period (the course’s title and scope). It worked great and culminated in a “Meeting of the Minds” in-class debate where the students channeled their historical figure to debate current issues. It was also a great deal of fun. I also strive to do this but have fallen short of a true course redesign. My greatest success is allowing students to complete a capstone project that takes the heart of our topic (in this class “Making the Modern City”) and apply it to Nashville. You can see from the student projects that their topics were wide-ranging and truly interdisciplinary. Their shared capstones were/are part of my own final project for HIST680 with Dr. Robertson. The first part is easy. I love it. The most consistent feedback I get on evaluations, going back 15 years, is that I am passionate about what I teach. In watching Caldor’s interview I realize that I already employ aspects of “Uncoverage.” But I have much to learn to help students “decode the discipline” and get past “threshold concepts.” I also need to move more toward experiential learning and away from the text-driven/teacher-driven model. The method does matter, i.e. digital learning and projects help with the first two questions. But also important, my passion for the subject matters too. Because I love history I need to dissect and reexamine my methods as I continue to teach. Dr. Kelly’s article “The History Curriculum in 2023” was music to my ears and I agree wholeheartedly with his view of teaching history and of the state of our history curriculum as it stands now. As an addendum to this post I believe his article has pushed me further toward a total course redesign for undergraduate and 9-12 history courses. At the high school where I teach they unveiled and made a substantial financial investment into a maker space that they named “Design Den.” And while it is open to all classes, it is not geared toward history or the humanities. We need history “lab” spaces and we need to better investigate ways to use 3-D printers and the like in our curriculum. As historians we cannot simply remain vessels of knowledge or even master teachers, we must also figure out how to harness new technologies to engage students actively and as participants while not abandoning basic skills of research, writing, and critical thinking. It is and will remain a challenge but one we must accept if we hope to stay relevant in a drastically changing landscape in higher education, and more important, skills that translate into the professional world. 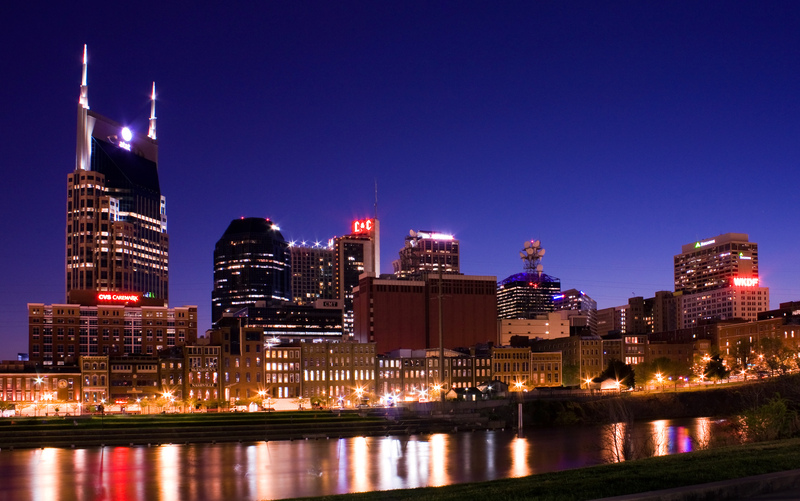 Nashville Skyline, 2009. Image courtesy of Wikimedia Commons and in the Public Domain. This timing of this module was serendipitous. I have a great-aunt and great-uncle (Jean and Ben) who are in town for the next two days, and I was able to interview them tonight at dinner. They did not come to Nashville to visit me, but rather asked me to dinner because they were here. This perhaps made the small talk easier, but I was surprised by some of their answers. Ironically I learned quite a bit about both of them during the process of the interview as the subject and purpose of the questions were unrelated to family. I have lived in Nashville for several years, but I had no idea that they attended college at Belmont University (then Belmont College) in the 1960s. They said they have always loved Nashville and feel connected to Belmont, but the reason they come to visit is based on the music and cultural scene of the city. They like country music, but are not part of the “honky tonk crowd” per their description. They are both retired teachers who grew up and have lived most of their lives in northeast Georgia. Ben and Jean love to come to Nashville every 1-2 years as a “getaway” and prefer it to Atlanta because of the downtown district, museums, good restaurants, and its walkability. Their plans included a Valentine’s Day concert featuring Frankie Valli and the Nashville Symphony, which plays in the amazing, yet often overlooked, Schermerhorn Symphony Hall located in the heart of downtown. My great-aunt and great-uncle both like history, and particularly southern history, but their knowledge of Nashville history is fairly basic. For example, they knew Andrew Jackson lived in Nashville and that Fisk University played a role in the Civil Rights movement, but did not know that James Polk was from Tennessee or that Nashville was largely occupied by Union forces during the Civil War. Jean and Ben love music of all genres and are nostalgic about blue grass and the Grand Ole Opry in particular. They thought that my project sounded great and both would be interested in using it as a walking-tour guide of important historical sites. Even though they are staying in a hotel downtown and have walked around the downtown area, they described it as “wandering around” with no real sense of purpose or geographical pattern. Their question for me, and one that I did not include in my original interview, is important if this project is to succeed. They asked, “How would we find out about this website and project?” This is something that I am going to have to consider. One option is involving the Chamber of Commerce and local hotels. Another option, which I have discussed with the Metropolitan Historical Commission (which manages the historical markers) is to add some kind of brief leader line, info, the web address to the physical historical markers themselves. This could perhaps be added to the back of the markers but would require MHC and Metro Council approval since it is public, tax-funded property. The second potential-user interview was completed retrospectively. A friend of mine recently hosted a couple who traveled to Nashville from Vermont for vacation. My friend asked if they would mind being interviewed and they agreed. I called and interviewed John and Pat Buttrick this week, following their recent visit. They were drawn to Nashville because they have never visited and, in their words, “kept hearing about how great it was.” Both of them are middle-aged working class Caucasians who save up and take a one-week vacation each year. The Buttricks knew very little about Nashville’s history other than the fact that there were Civil War sites. They were drawn primarily to “see the sights” and visited the Johnny Cash Museum, Ryman Auditorium, spent time in records shops and honky tonk bars. They reminded me that “Yankees like country music too.” I asked if they saw any of the historical markers downtown and they said they read several as they walked around downtown. Pat commented that they took a picture with one entitled “Birthplace of Bluegrass” that is positioned in front of Ryman Auditorium. They also visited the Hermitage (approximately 15 minutes from downtown) and rented a car to visit Mammoth Caves, a vast system of underground caverns that is approximately an hour from Nashville. They said that they chose not to do a trolley tour because it was too expensive and took too much time, but a project such as mine would be very appealing to them. When I asked what would make nashvillesites.org useful for tourists, they said, “It would be great if you added good restaurants near each location and the prices/hours of museums.” Both John and Pat noted that they also came to Nashville for the food, and in particular, “barbeque.” While this may be beyond my scope and purpose – particularly for a project sponsored by local government, I could perhaps provide links that already exist for food, museums, etc. I learned several things from both my initial interview protocol as well as potential user interviews. My research has validated the need and usefulness of nashvillesites.org as an engaging tool for visitors, whether they are in Nashville for the first time or are frequent guests with a prior connection. I found that many of my original interview questions were not very effective because they assume, to an extent, that the average visitor to Nashville knows little about the subjects of my questions. Prior historical knowledge about Nashville, and the context of Nashville’s history when compared to other southern cities and U.S. urban areas is minimal and largely generalized. From my research and interviews I was able to determine what people are interested in knowing about Nashville. Albeit with my prompts, all those interviewed were curious about Nashville’s role in, for example, the Civil War or Civil Rights movement once I gave them basic bullet points. Another subject of great interest is music, and so the historical markers related to historic events or sites of music history will be important to the project’s success. The interviews also provided me with new challenges. For example, how can I design the project so that people can and will use it? How can I market it so that visitors or residents know that it exists? Can I make it educational and engaging in a way that complements the physical historical markers? And finally, how do I navigate an independent project within the constraints of local government rules and regulations?